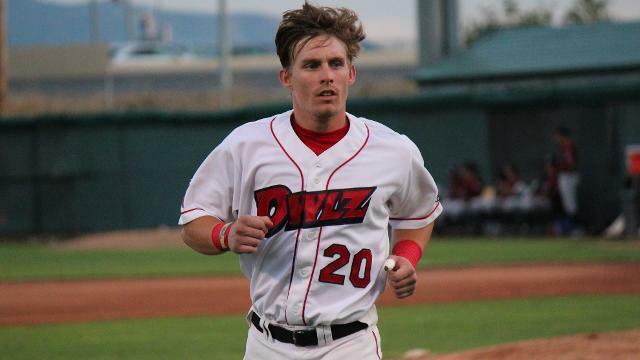 Having gone nearly a month since their last scheduled day off, Caleb Adams and his Orem Owlz teammates saw the promise of rest with a Saturday night win. They didn't let that chance slip away. The Angels prospect belted a second-inning grand slam to power Orem to a 7-4 win over visiting Ogden and a sweep of their best-of-3 Pioneer League semifinal series. "It's a load off our minds to go in there and get the first two wins," Adams said. "Also, it's a big plus for us to get that off day; we haven't had many. I think we've had 24 games straight to end the season, plus the playoff games. We'll get a day off tomorrow, travel up to Montana and start the championship." Orem's last scheduled day away from the field was Aug. 11 and this time, the Owlz will get two. Their break on Sunday and Monday will be sweeter after the first-half South Division champions took care of business. After spotting the Raptors two runs in the top of the second, the Owlz plated six in the bottom half and never looked back. Adams followed Michael Strentz's RBI single with his bases-loaded blast to put Orem ahead for good. "I wanted to put the ball in play, preferably something hard," said Adams, a 10th-round pick in this year's Draft. "I got a good pitch to hit and put a good swing on it. Luckily, it sailed on out of the ballpark. It was a big moment, but we scratched and clawed up to that point. We got into that situation and kind of just made things happen for ourselves." The Owlz added a run in the third and leaned on their pitching staff the rest of the way. Starter Michael Bolaski (1-0) allowed three runs on seven hits while striking out six over 5 2/3 innings for the win. "We've had a couple games against Ogden where it was back and forth, back and forth like that," Adams said. "We'd have a big inning, they'd come back with a big inning, but we've got a bunch of grinders and bulldogs on the mound, just like I feel like we do at the plate. This team will scratch and claw their way back into any ballgame, we're never out of it. Our pitching staff did a great job coming in and slamming the door shut." The win, coupled with Billings' sweep of Great Falls, means Adams' team will head north for the opener of the Pioneer League Championship Series on Tuesday. The Mustangs took five of seven meetings during the regular season. "I don't think we're going to try to overdo it," Adams said of his team's mind-set. "We're not going to psych ourselves out or anything. We're going to take the same approach that we have all year. We've had a good team, solid team throughout the entire year. We're just going to go up there, play as hard as we can, take it to them as best we can and hopefully come out with a win."